Modern wordpress template is a clean, minimalist design. This is a 2 column wp theme with main content area on the left side and sidebar on the right. Most of the site is white, only sidebar is gray and if you pass the mouse over the pages links, they also turn gray. The sidebar contains all the standard wordpress menus, but does not support wordpress widgets. 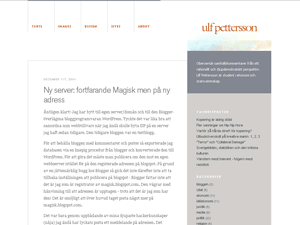 Modern wordpress template was designed by Ulf Pettersson.